It has been far too long since my last Wednesday Drill of the Week. I apologize for the lack of posting recently – there has been some changes in my life that have taken most of my attention. This week I’ve got a simple yet effective 1 on 1 drill that can be used to teach both forwards and defensemen. Forwards and Defensemen start the drill in opposite corners. Defensemen have the puck. 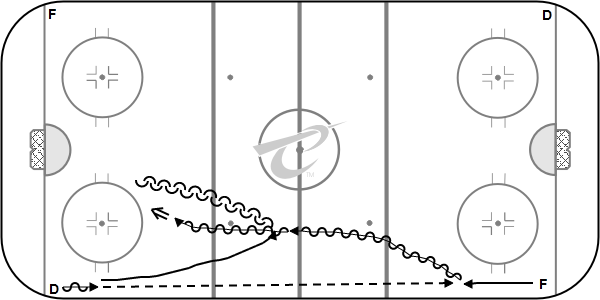 Both lines start skating at each other until the D makes a long pass to the Forward. The D continues to skate towards the F, and then transitions front to back when they gain a good gap. The F receives the puck and attempts to attack the D. The two players play out the 1 on 1. For defensemen, this is a great drill to work on gap control, skating ability and transition skating. The D has to gain ice as quick as possible, then adjust to the speed of the forward, all while maintaining proper positioning in the middle of the ice. They should also focus on stick position and forcing the Forwards into an unfavorable position (backhand side or out wide/down low). Forwards need to work on accelerating with the puck and situational awareness. It is a test for the forward to try to put him/herself in the best possible position to get a quality scoring opportunity. They should work on reading the defenseman and recognizing when to attack and when to slow play the situation. They should also attempt to gain the shoulder of the D-man, protect the puck, and drive to the net.